Possibilities for Change is helping SBHC overcome barriers and create positive change. RAAPS also offers unique benefits at the state-level by providing dashboard reporting and insight into the unique risks and trends across a state’s youth population. This reporting can be viewed at the “overall” state level, be broken down by socio-demographic variables, geographic region and/or by individual centers. 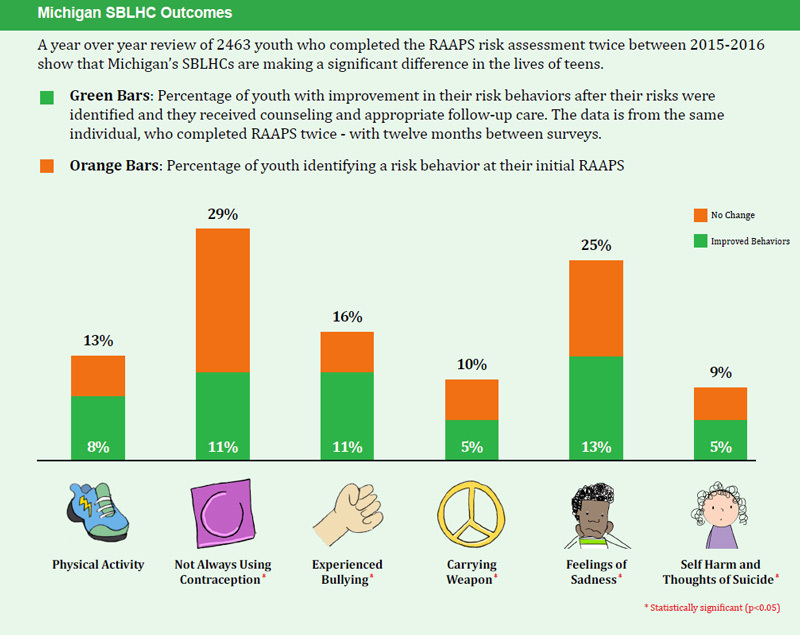 With funding and support from Michigan’s Child and Adolescent Health Center Program, School-Based and Linked Health Centers (SBLHCs) across Michigan have implemented standardized risk screening using the RAAPS cloud-based system to identify these risky behaviors and provide risk reduction counseling using effective, evidence-based methods – including motivational interviewing. This state-wide initiative was launched in 2011, and to-date over 100,000 youth across 97 Michigan SBLHCs have been screened and provide risk reduction counseling using effective, evidence-based methods – including motivational interviewing. Learn more about the risks and trends identified as a result of this collaborative effort. "It has definitely been worth the investment. We're using RAAPS data to better and more precisely inform program development. That's really helping us fulfill our mission: improving the health, safety, and academic success of our students." "Data is the lifeblood of any state-funded program. We wanted to know: are we directing programming to the highest risks and are we able, through identification and risk reduction counseling, to change those risks over time. With RAAPS we can identify trends and tailor our programs to real needs. And - with the right data we can make the case for new funds. RAAPS was a great investment for the State of Michigan." "RAAPS' electronic features make it a 'must have.' Teens complete RAAPS faster, more thoroughly and more honestly than they did the former, longer, paper assessment. Health providers supporting a given teen can access that teen's results, review results more efficiently, and there's consistent information across the entire patient population."